Weiss Guys was founded in 1960 by cousins Roland and Jerry Weiss, who moved their young families from Cleveland, Ohio to Phoenix to start their own business. Their brothers Jay and Howard Weiss, respectively, joined the family business in the late 1960’s. In 1999 after working for the company for 18 years, Terry McDonald became an owner as well. Weiss Guys is a family business with several other members working for the company. Our maintenance crews and generals managers have worked for the company for 25+ years. 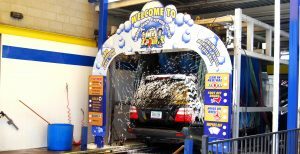 In 1998, Weiss Guys sold 10 of their full service car washes, but continue to operate 11 self‐serve/exterior car wash facilities in Arizona. Several of the Weiss Guys facilities now have a new dog wash bay, a unique service in the car wash industry!